If you are interested in receiving training in the area of finances, accounting, budget reporting, and spend your day in an office environment, military occupational specialty (MOS) 36B Financial Management Technician is a great stepping stone to further training as an accountant or financial planner when in the civilian world. If you want to serve your country, there are many jobs that fit everyone's general skill sets and interests. From the soldiers who go into the combat, the soldiers who supply and equip the Army with food, gear, weapons, and ammunition, to the administrative staff that keeps the system moving along with pay, benefits, bonuses being allocated to all the troops. This job falls into that latter category. 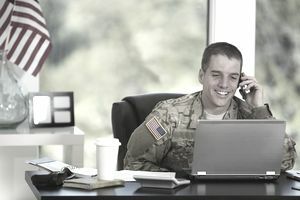 Although most people probably don't go into the Army with plans to crunch numbers, these soldiers make sure that money gets where it needs to go, that everyone gets paid on time, and that the Army's resources are being spent according to protocol. The finance management technician is responsible for handling commitment and obligations documents as well as accounting and budget systems. MOS 36B receives and processes treasury checks for payment, maintains disbursing files and prepares financial reports. Being a financial management technician requires you to prepare and compute travel vouchers as well as process pay documents. MOS 36B will also review contracts, invoices and receiving reports, and prepare payment vouchers in accordance with various government regulations. These soldiers may also be called upon to act as cashiers. Job training for a financial management technician requires ten weeks of Basic Combat Training (boot camp) and nine weeks of Advanced Individual Training (AIT) at Fort Jackson in South Carolina. Some of the skills you’ll learn include accounting principles and procedures, maintenance of financial reports and budgets, analyzing financial data and computation of pay and deductions. You'll need a score of at least 101 on the clerical area (CL) of the Armed Services Vocational Aptitude Battery (ASVAB) tests to be eligible for this job. No Department of Defense security clearance is required, but you'll be subject to a background check since you'll handle large amounts of money on a daily basis. In addition, you should have no convictions of any crime involving "moral turpitude," and have otherwise impeccable character and integrity. You'll be well qualified to work as a civilian bookkeeper, accountant or auditing clerk, and can likely find a career as a payroll or timekeeping clerk outside of the military.